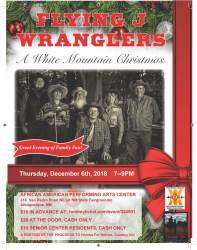 International Western Music Association - New Mexico Chapter is proud to present the Flying J Wranglers "A White Mountain Christmas" show on Thursday, December 6 at 7PM at the African American Performing Arts Center. Come join us in celebrating Christmas the Western Way! The Flying J Wranglers of Ruidoso will provide an evening of great music, humor, and yuletide cheer as they sing and play a mixture of Western, spiritual, and popular Christmas classics. Bring the entire family as kids get in FREE. Senior center residents only pay $10 cash. Tickets are available online for $15, or $20 CASH ONLY at the door. Silent Auction! Doors open at 6PM for snacks and drinks, plus purchase raffle tickets for artwork and a beautiful Christmas wreath. Help support our veterans! A portion of the proceeds from this show will benefit Horses for Heroes, a fine organization that serves our military veterans with PTSD. Visit HorsesForHeroes.org for more information. 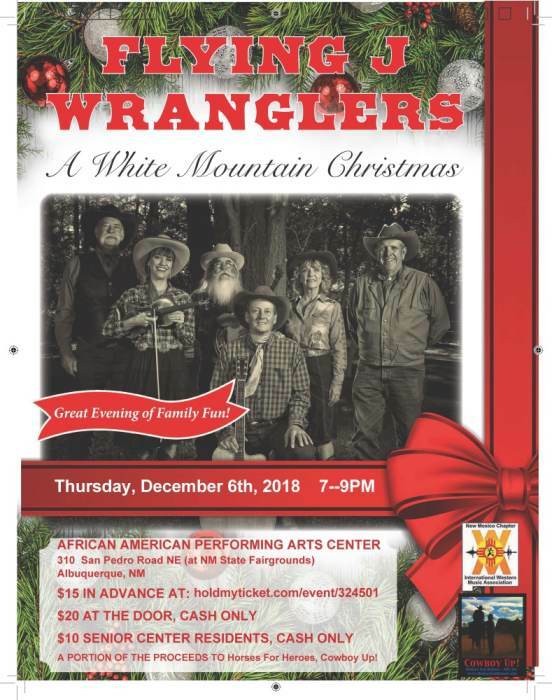 Please come and enjoy a wonderful evening of music and laughter with the Flying J Wranglers at the African American Performing Arts Center at the corner of San Pedro and Copper, at the NM State Fairgrounds. Parking is FREE.